Well hello again and the blog apologises for an absence even longer than Melania Trump's, still being occupied by pressing family matters. Here in London, the Great English Summer is upon us and my goodness, how good it is to get proper English strawberries that actually taste of something. I looked at the packet I bought in Waitrose yesterday and observed that it came from Sussex. Just down the road then. A whole lot better than getting them refrigerated from California. OK, western New York does grow its own strawberries but they don't taste anything like British ones. I have been enjoying some ambles on Wimbledon Common, which is the home of the Wombles. For the benefit of my American friends, these chaps live underground on the Common and only come out at night, when they pick up rubbish left behind by slobby picnickers. Their services are more needed than ever. Sad that the other day I spoke to a small child who had never heard of the Wombles, which were big in the 1970s, generating a TV series, films, songs and so on. The original books were by Elisabeth Beresford. The Wombles had names like Orinoco and Uncle Bulgaria. I recently walked past an Orinoco Street in Wimbledon. Presumably future generations will puzzle over the name. 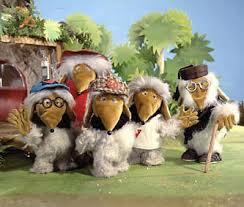 I think it's high time for a Womble revival. More on the fabled Common coming up. Watch this space. Update: Where are the Flags?